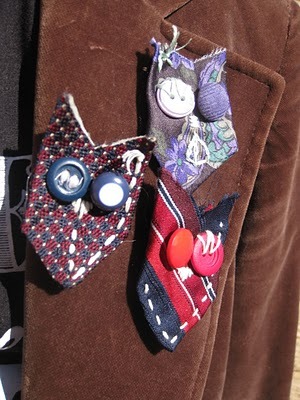 Dear blog readers, I know some of you noticed in my last post.. yes there was something else going on in my hat refashion photograph - two little owl broches made from the same necktie fabric as the hat band. Recycled Fashion is drawing close to 100 subscribed readers on blogger, and has reached over 200 'likers' on facebook, so to mark this occasion, I would like to giveaway three sets of mummy and baby owlet brooches I have made. Who would like a pair of mummy and baby owlets? 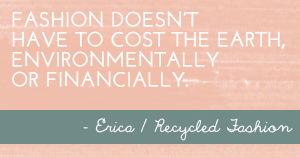 It doesn't matter where you are in the world, if you would a set of owls, please leave a comment below, or on Recycled Fashion's facebook page. I will draw the winners two weeks from now. I have a condition! I would like a photograph emailed back to me showing the owls in their new homes, whether you decide to use as brooches, to decorate on a bag, or somewhere else, it would be great to see where the owls have landed! 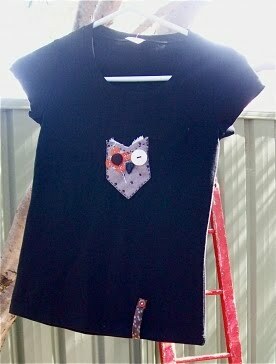 In conjunction with my giveaway, Ally at Harrys Desk is giving away 3 tutorials, 2 tutorials complete with all the pieces needed to make your own owl brooch, and 1 t-shirt. Pop over to Ally's blog and enter her competition if you would like to learn how to make your very own cute little necktie owls. This t-shirt from Ally's blog could be yours! Those are so cute! I like the one with the leaf eye, he looks a little crazy. You have such talents! Spooky...I have that exact orange floral vintage fabric...it was cafe curtains that I picked up at a jumble sale. The owls are very cute too. I like the one with the mummy with the flower in its hair. Hmm - I might put them on my handmade nappy bag once my own little owl comes along. My 7 year old son loves the owls and really wants to make a family of them so he would love a parent / child set to start this off. I love owls and these are so cute. I remember seeing them on moobeardesigns when she made them, then I saw it on your shirt and was like HEY! that's those owls. I would love to win and would happily photograph them in their new homes. 100 followers - hoot hoot!! I am not entering but wanted to say yay! on the followers century and the facebook likers. Very cute! I noticed them on the first photo, but didn't know that they were owls! Ok, what can I possibly add to the very long list of compliments, and rightly so, on your very cute idea..Cute and twee and such like descriptions...I do like it VERY MUCH..Where would I put them? Off the top of my head, I really don't know.I would have to give it some serious thought..Congrats on your 100 followers. That is quite an achievement..Celebration time, me thinks..
Woohoo Thanks for the linky love!! 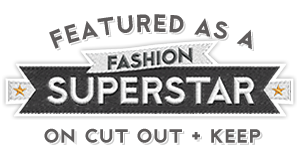 I have finally gotten around to sorting out some of my blog links and have created a refashion group. How addictive are the owls to make. I went out and bought 10 mens ties just to make some more...hehe. Good luck with the giveaway I am off to tell everyone about it!! ps exclude me from the giveaway ...lol... I have enough. so so cute! i love them!!! Awesome, thanks for adding me to your new refashion group Steph! And you are so right, the little necktie owls are quite addictive! Oh YUM! These are great! So unique. Beautiful work! I'd wear the pants off those puppies! love that they are mum and baby - cute! So sweet! COunt me in! Ein toller Shop für Krawatten. Meine neue Krawatte passt mir perfekt und das für 12,90 (Seide!!). Your comments are appreciated, thank you!